We all know that bees are a vital part of the ecosystem, and we know that bee populations are threatened by a wide array of factors. Fortunately, awareness campaigns and growing interest in urban agriculture have led to a renaissance in human and bee relations. Increasingly, beehives are becoming a cherished feature in gardens and backyards across the country. These colonies pollinate flowers and crops, are quieter and easier to care for that other animals like chickens, and provide a useful and delicious supply of honey and wax. Even NatFAB’s own John & Bonnie Boyd Culinary & Hospitality Library has a honeybee hive in its backyard. Many thanks to Adam Strain of Let it Bee Apiary for coming to manage our beehive recently--check out his Instagram @letitbeenola for amazing videos of the work he does (and how he got more than 40 pounds of honey from our little hive!). 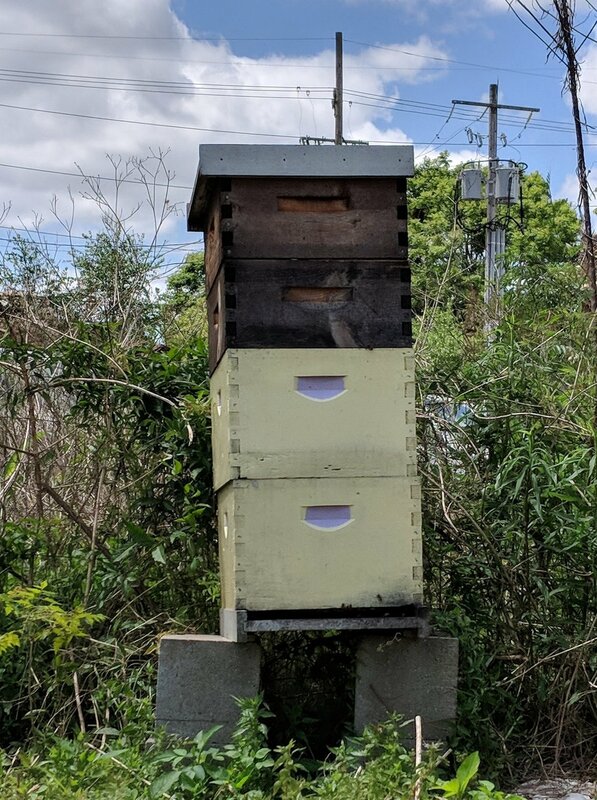 Inspired by those busy library bees, let’s take a brief look into urban beekeeping and some of the resources to get you started on your own colony. The first thing you need to know is that honeybees are gentle and are generally content to buzz peacefully from flower to flower. That said, if the bees are near their hive, they will defend it. Always give an active hive plenty of space and wear protective gear when interacting with the hive. When considering beekeeping, it is essential to know if you or anyone in the household are allergic to bee stings before you invest in your own colony. It is a good practice to talk with your neighbors too for the same reasons. Beekeeping can be a rewarding hobby, but it may not be suitable for everyone. Don’t worry if beekeeping turns out to not be an option for your situation. Planting a pollinator garden for the passing honeybee, using bee-friendly insecticides and fertilizers, buying locally made bee products, sponsoring a hive, and donating to organizations like the Honeybee Conservancy all help to support local beekeepers and bee populations. The easiest way to get started with beekeeping is to host a hive. There are a growing number of beekeeping companies and individual beekeepers that will set up and care for a hive on your property, and all you have to do is provide access. The company owns the hive, the bees, and the honey and takes care of the maintenance and harvesting of the honey. The company will pay rent for the use of your property to house the bees. The bees will pollinate your plants and provide an interesting feature to your landscape. This arrangement allows you to support a thriving colony of bees who will improve your garden’s productivity and health without requiring care and upkeep on your part. If this type of beekeeping sounds right for you, contact your local beekeepers and beekeeping associations. They will be able to connect you with the right company or individual beekeeper. If you plan on being an active beekeeper, first do your research. The size of colony your home can support, local laws and ordinances on beekeeping say, and the equipment that best fits your set up are just a few of the topics you will need to research before setting up your own hive. The best way to learn about what you will need to know is to find your local beekeepers and learn from their experience. Beekeeping is a growing hobby and business venture, and most established beekeepers are happy to share their knowledge and expertise with budding beekeepers. Those established beekeepers are also a great resource for finding affordable or second-hand beekeeping equipment. Setting up your beehive is the hardest part of beekeeping, so prepare well for the task ahead of time to ensure a successful home for your colony. If you want to help bees but not actually have a colony of bees, consider planting a pollinator friendly plant or garden. These bee-friendly plants also attract birds and butterflies too! Here is a brief list of common pollinator friendly plants. Contact your local gardening center or beekeeper to learn about which plants best suit your area. Fruit & nut trees: lemon, satsuma, apple, cherry, peach, pecan, and more. Flowers: Coneflower, bee balm, black-eyed Susan, goldenrod, cosmos, zinnias, sunflowers, butterfly bush, and more. Herbs (if you allow them to flower): sage, basil, lavender, thyme, rosemary, mint, oregano, and more. Vegetables (if you allow them to flower): broccoli, squash, kale, berries of all kinds, tomatoes, peas, and more. Join us for the month of April 2018 as we Spotlight the Gumbo Garden as part of the 10 Years of SoFAB programming! To celebrate the development of the Gumbo Garden we will be hosting a variety of programs and demonstrations that explore growing your own produce, using local ingredients, and enjoying the all-too-brief season of (pleasant) outdoor cooking in New Orleans.